Caffeine can help you shake off lethargy and boost your attention levels, but using too much can result in some unpleasant side effects. In addition to coffee and tea, caffeine naturally occurs in the cocoa in dark and milk chocolate, and as an additive in soft drinks, energy drinks and coffee-flavored ice cream. The mildly addictive nature of caffeine can result in headaches when habituated users abruptly cut back or eliminate caffeine completely. Caffeine consumption stimulates neurological activity in your body and brain, and results in constriction of your blood vessels. It also increases your heart rate. The effects can be mild or extreme, depending on the amount of caffeine you ingest and how sensitive you are to the drug. Because your heart beats faster and because the increased blood volume pushes against narrowed blood vessels, you blood pressure goes up temporarily when you drink a caffeinated beverage. In some individuals, caffeine consumption results in a type of excessively fast heartbeat called atrial tachycardia. A moderate amount of caffeine, 200 to 300 mg a day, is about the amount in a 16-oz. coffeehouse brewed beverage. Dark, intense brews from premium coffee vendors can have even more caffeine. High caffeine intake over 600 mg per day might not be sufficient to trigger a heart attack, but the fast heartbeat and the pounding sensation in your chest that accompanies high caffeine intake might lead you to believe you are about to have one. Increased anxiety and restlessness caused by high caffeine consumption worsen symptoms. Some over-the-count pain medications contain caffeine, and other drugs intensify the effect of caffeine you drink or eat. Antibiotics such as ciprofloxacin and norfloxacin impede the breakdown of caffeine in your system, so you feel caffeine's effects longer when you take the drugs. Bronchodilators used to open up airways in asthmatics or those with breathing problems have similar effects as caffeine on your heart, so the combination can intensify caffeine's effect. Symptoms might include a pounding heart, and nausea. Continued overuse of caffeine combined with bad diet, high blood pressure and smoking can lead to heart disease. When your heart beats inefficiently due to irregular beats or diminished vigor, blood can pool in the heart, leading to the creation of blood clots, and stroke or heart attack. 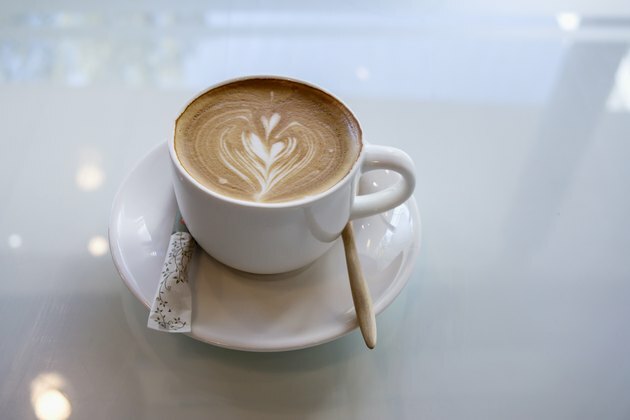 Moderate amounts of caffeine are likely not harmful, but if you have existing cardiovascular disease or irregular heartbeat, ask your physician if you can consume caffeine or if you should avoid it in all forms.